Mechanical Piping Services (MPS) is a Western Australian family owned and operated company, which specialises in the manufacture and supply of custom copper pipes and fittings and large bore copper. Established in 1977, we have grown to become one of Australia’s premier suppliers of copper pipe and fittings to the construction and plumbing industries. We are also licensed plumbers and gas fitters and can assist in the design, installation and manufacture of specialised fittings to suit our customers’ requirements. In 1998, Mechanical Piping Services became a Quality Endorsed Company. As such, we are continually reviewing and working to improve all aspects of our business, including the quality of our products. Our team members are highly skilled and experienced and committed to delivering high quality products with prompt deliveries and outstanding customer service – we have specialists available to assist with enquiries, orders, and after-hours emergencies. Mechanical Piping Services is the only company in Australia that specialises in the manufacture of large bore copper (LBC) tube and fittings. These products are suitable for a range of applications, including condensers, chilled and heating water pipes, fire service equipment, and pump headers. We supply a large range of bore copper products, including bends, stub flanges, reducers, caps, tees, copper coils, and unique copper pipe work. We also have products suitable for working pressures of 700kpa and can accommodate custom-made fittings. Our large bore copper tube is supplied in 2.5m lengths with one end expanded ready for on-site installation. Sizes range from 250mm (10″) to 500mm (20″) in 50mm (2″) increments. Mechanical Piping Services holds enough sheet material in stock to manufacture complete orders, (subject to prior sale) so there is no delay in delivery. Our products are available for delivery throughout Australia. We offer very competitive prices and accept orders of all sizes – no matter how large or small. Mechanical Piping Services is an AS/ISO 9001:2000 Quality Endorsed Company, Lic # 11994. We are located at 20 Denninup Way, Malaga. 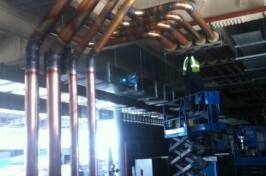 For further information, email sales@mechanicalpiping.com.au or phone (08) 9248 6767. Copyright © 2019 Mechanical Piping Services.